Bob and I had very different Jewish experiences growing up but similar values about philanthropy as we had great role models in our parents. Bob grew up in Clayton, Missouri where his high school was 30% Jewish. His father had an orthodox background from Baltimore, MD and his mother had a reform background from Fishkill, NY. Even though he and his family did not belong to a synagogue, they were part of the Jewish community, surrounded by Jewish friends and traditions, and had strong ties to multiple Jewish organizations. I grew up in Charlotte when there was no JCC and no Jewish Day School. I swam at the Amity club and went to religious school at Temple Israel four times each week with the 10 other Jewish kids my age. Our Jewish community was small but very connected – we called my parents’ friends “Aunts and Uncles.” I am humbled by my family’s leadership in this region. My mother’s grandfather, Benjamin Silverstein, was the second president of Temple Israel and my dad was the 23rd. My father’s grandfather helped start Temple Emanuel in Gastonia. During my childhood, I became a Bat Mitzvah and BBYO Eastern Region N’siah. Bob and I lived in the same freshman dorm at Brown University. We met when his roommate tackled me in the hall while they were playing Frisbee. We were married just before I received my MBA from UNC/CH and Bob received his MD from Duke. We resided in New Haven for 6 years before deciding to live closer to family. In 1991, we moved back to Charlotte and immediately became involved in the Jewish community. Our children played sports at the LJCC, attended Charlotte Jewish Day School, became B’nai Mitzvah at Temple Israel and were active members of BBYO. When our four boys were young, we had most Shabbat dinners with extended family. We treasured this time with multiple generations, learning about family history, discussing Jewish values, and reinforcing “life lessons.” Bob was a Bar Mitzvah at age 42, six months before our oldest son. After volunteering for many Jewish organizations, I became the FCJC coordinator of the Create Your Jewish Legacy Initiative in 2012. 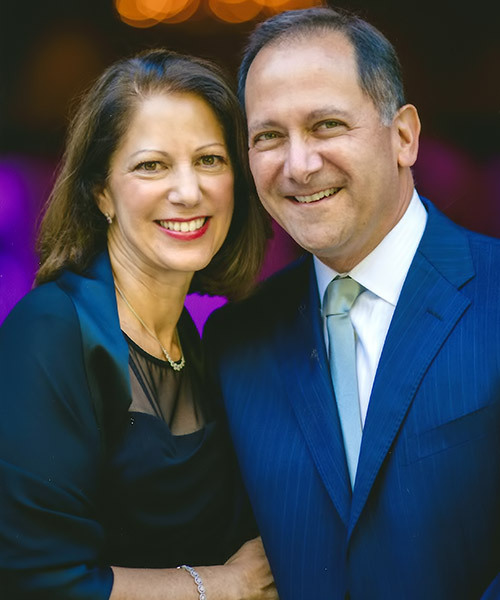 Bob and I are passionate about the Jewish institutions that allowed us to experience the warmth and traditions of Judaism and supported us as we raised our family. We have made legacy gifts so these agencies will thrive long into the future for generations to come, and others will experience Judaism the way we did in this wonderful community.